After carving pumpkins and stuffing your face with candy corn, haunted hayrides are one of the best ways to celebrate Halloween. Piled into a wagon with your friends and family, you get to scream your lungs out into the October night — and these haunted hayrides are so much more than a quaint trip through the pumpkin patch. Killer clowns, chainsaw-wielding madmen, and the Headless Horseman himself come complete with special effects, dedicated performers, and frightening storylines. These haunted hayrides will be worth every nightmare they’re sure to give you. Niles Scream Park lets you know that it’s not responsible for dry-cleaning bills when visitors wet their pants. If that level of scared sounds like your kind of good time, then you’ll want to climb aboard the park’s Dark Terror-tory Haunted Hayride. Once safely seated in the wagon, guests are pulled past more than 30 sets on a mile-long trail. Part horror and part humor, the scenes work together to tell a story. The narrative, which changes every year, draws guests in and makes them part of the show. Tickets for the hayride cost $8 per person. For the hayride as well as access to the entire park, combination tickets cost $30 ($35 on Saturdays in October). Other attractions include a haunted house, haunted corn maze, and an experience called “Hooded,” during which thrill-seekers are alone and blindfolded. For most of the year, the woods around Pinehaven Farm are peaceful and void of evil. But every fall, brave souls gather to test their courage at the Dead End Hayride, the self-billed “ultimate horror experience.” The journey’s hair-raising scenes are made even more so by cryogenic blasts, explosions, and pyrotechnic displays. If you manage to make it past the horrifying creatures prowling among the trees, you’re welcome to rest at either the Pinehaven Motor Inn or Sunnyvale Asylum. Don’t let your guard down, though. Creepy clowns have been known to follow visitors out of the woods. The Friday and Saturday before Halloween, general admission tickets cost $30 at the door. Before you can experience the Los Angeles Haunted Hayride for yourself, you have to walk through the gates of Purgatory. Set in the abandoned Griffith Park Zoo, the haunted village features a variety of Halloween experiences, such as rides on the Scary-Go-Round and mind-readings by a psychic. But the real scares are waiting for you in the haunted woods. Stay on the lookout for killer clowns lying in wait for an unsuspecting passerby. Tickets, which include admission to Purgatory and the haunted hayride, cost $36 per person. Creamy Acres Night of Terror Farm knows how to make visitors scream. If you dare, climb aboard the Ride of Terror haunted hayride for 25 acres of terrifying zombies, psychotic clowns, and chainsaw-wielding madmen. You never know what’s waiting for you around the next turn or lurking among the cemetery headstones. General admission tickets cost $35 per person and include access to the other park attractions. If you survive the Ride of Terror, check out the Haunted Paintball hayride, where you have to fight to protect yourself from the oncoming zombie hoard. 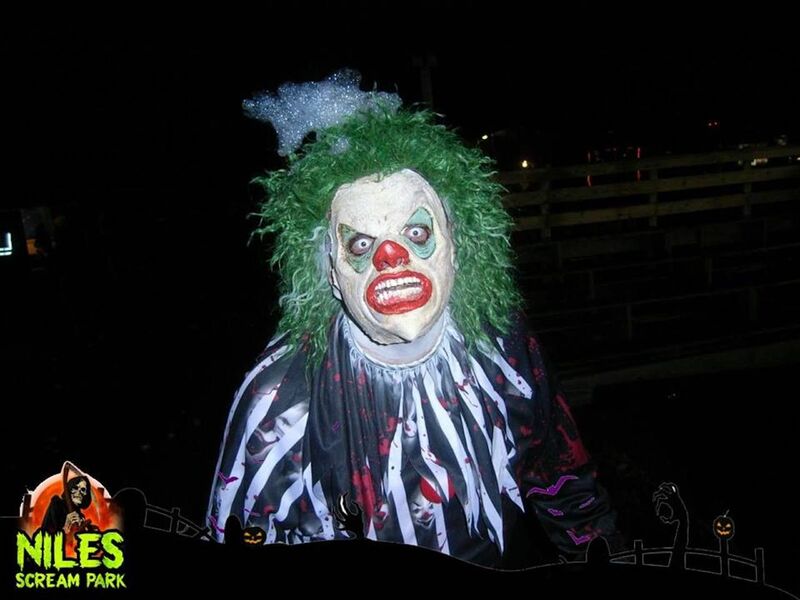 The Haunted Paintball hayride is separate from the other attractions and costs $25 per person. Combination passes are available for $75 each. The undead are coming, and for any hope of survival, you must stick together with your hayride companions. The Legends of the Fog haunted hayride takes visitors on a long and spooky journey through a zombie-infested junkyard, haunted forest, and creepy cornfield. Are you sure you should trust the friendly local who offered you a ride? Keep a close eye on the rest of the group — and your limbs. Whatever happens, don’t stop moving. You don’t want to get caught by the fog. Hayride tickets cost $20 while a $30 combination ticket allows you to experience all the attractions. Did you hear that sound? It’s werewolves howling at the moon, and they’re emerging from the darkness of Witch’s Wood to encircle your wagon. The werewolves aren’t the only ones attracted to the scent of human flesh. While the good witches do their best to keep guests safe, zombies and other unknown creatures inhabit the forest. Try your hardest to get away, but the spirits of dead lumberjacks want to hack your wagon in two to ensure you never leave. If you haven’t screamed enough after the haunted hayride, check out the park’s other attractions, such as the Keeper’s Crypt. The three-dimensional land of the living dead promises a whole new level of terror. General admission tickets cost $38 per person. This 250-year-old farm in the historically haunted Hudson Valley sets the perfect spooky scene for Headless Horseman Hayrides. On the mile-long hayride, you’ll tour the abandoned town of Old Crow Hollow and come face to face with evil creatures — made up in incredibly terrifying costumes — that want to drag you into the darkness. Ichabod Crane didn’t get past the infamous Headless Horseman. Will you? General admission tickets cost $50 plus tax. In addition to the hayride, the price of admission includes access to a haunted corn maze, six haunted houses, and a dark circus sideshow.